Train services are once again being affected by strike action across Yorkshire today. 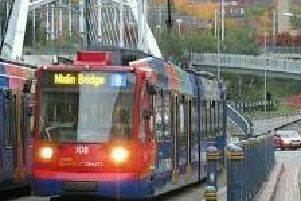 Commuters across Yorkshire face another day of delays and frustration as strike action leads to a reduction of services. Rail strike: How are the services affected in your area of Yorkshire today? Workers at two rail companies are said to be solidly supporting a fresh strike in the bitter dispute over the role of guards on trains. Members of the Rail, Maritime and Transport union at Greater Anglia and Arriva Rail North (Northern) mounted picket lines outside stations after walking out for 24 hours. A statement on the Northern Rail websites states: "To help keep you on the move during RMT strike action on Wednesday 9th May we will run more than 1,300 services. "The majority of available trains will operate between 7am and 7pm as we focus on running as many trains as we can to get you into work and home again. During these hours, we will operate around 65% of the normal weekday timetable. "As the overall number of trains running will be reduced, we expect trains and any replacement buses we operate to be extremely busy. Please allow extra time for journeys, plan carefully and consider whether travel is necessary. "During the RMT strike action we expect all services to be busy, especially in the morning and evening peak periods, and advise you to allow extra time to travel." Greater Anglia said it was running a normal service despite the action, but Northern services were affected. RMT general secretary Mick Cash said: "RMT members on Northern Rail and Greater Anglia stand rock solid and united once again this morning in separate disputes which are about putting public safety and access before private profit on our railways. "It is ludicrous that we have been able to negotiate agreements in Wales and Scotland that lock in the guard guarantee, but we are being blocked from reaching the same settlement across the North and Greater Anglia. A solution to these disputes is within our grasp but the rail companies need to stop sticking their heads in the sand, get back round the table and work with the union to bolt it down. "RMT members have shown extraordinary resilience and determination in the fight for rail safety and we thank the public for their continuing support and understanding." Click here for the very latest news and tickets information on Northern Rail.